As the hectic holiday shopping season kicks off, YD Industries is once again proud to be an industry pioneer in the annual Black Friday Thanksgiving weekend retail marketplace. For the first time ever, YDI’s popular line of “Calypso’s Discount Palace” superstores will be hosting an in-store Thanksgiving Thursday buffet and merchandise blowout. Thanksgiving Thursday is the new Black Friday at Calypso’s! Following a slew of aggressive sale announcements from retailers including Target, Best Buy and Macy’s, YD Industries is upping the ante at Calypso’s by throwing doors open to deal seeking consumers at 5am Thanksgiving morning for a store-wide “buffet” of manager’s specials as well as in-aisle helpings of turkey, stuffing, mashed potatoes and other traditional holiday food offerings. Thanksgiving Day means consumers will find incredible bargains and scrumptious holiday eats in every single aisle of Calypso’s Discount Palace. 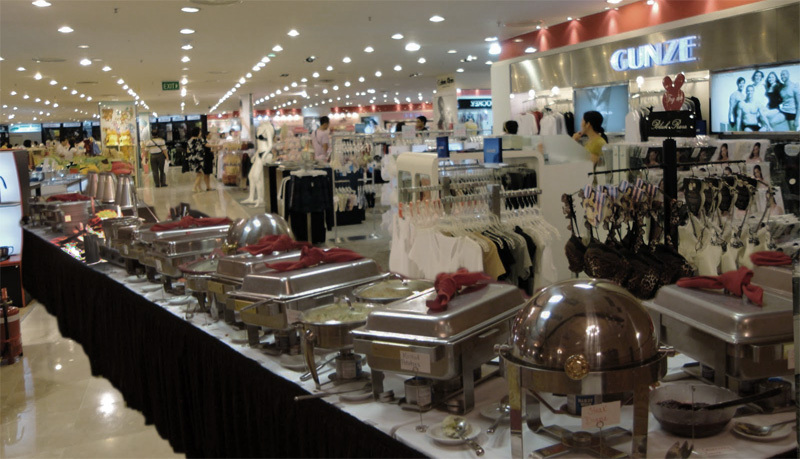 With carving bars stationed in Electronics and Kitchenwares, side dishes in Automotive, and pies and crisps in Toys, consumers will be afforded the opportunity to feverishly shop and take advantage of red hot bargains throughout the entire store without missing a single course of their traditional holiday supper. In addition, televisions will be tuned to football games, home furniture samples will be available for trial eating, and Lay-z-boy massagers will be available for naps between courses of food binging and deep discount splurging. YD Industries will also be leaving stores open throughout the night affording tryptophan weary customers the opportunity to sleep in the store so they can continue to take advantage of additional sales throughout the night, into Black Friday morning and throughout the weekend. The delicious in-store buffet, competitive deals and in-aisle holiday experience signify a truly revolutionary shift in the way that corporations attract consumers during the ultra-competitive holiday shopping season. YD Industries and Calypso’s Discount Palace are thrilled to be at the forefront of this effort and look forward to pulling out all the stops to bring in and retain more hungry holiday customers.